Tickets are now on sale for the 10th edition of Houston Rockets star Chris Paul’s CP3 PBA Celebrity Invitational, presented by GoBowling!, which will return to Bowlero The Woodlands on Thursday, Jan. 17. 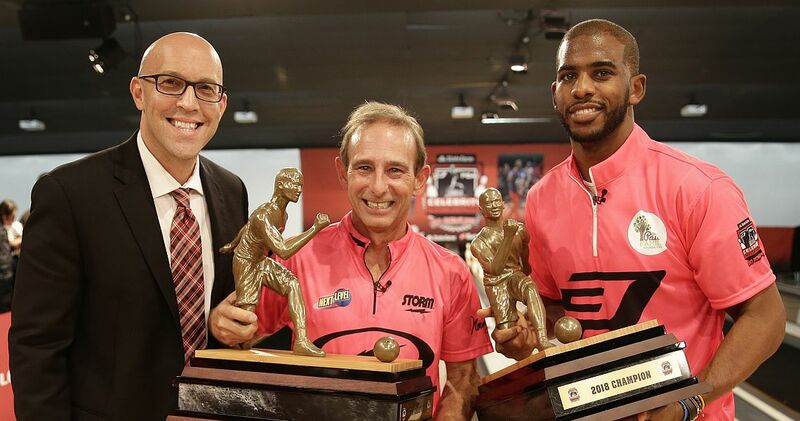 The star-studded CP3 PBA Celebrity Invitational will air on FOX on Super Bowl Sunday, Feb. 3 at 2 p.m. ET. Paul (featured photo right with 2018 partner Norm Duke, center, and PBA CEO and Commissioner, Tom Clark), the tournament host and a nine-time NBA All-Star, is hoping to defend his doubles title and win for the fifth time overall in the multi-format event which benefits the Chris Paul Family Foundation, a non-profit organization dedicated to promoting youth, education, health, sports and social responsibility. Paul and a group of his friends from the world of sports and entertainment will participate along with an all-star lineup of PBA Tour stars. VIP Package – $150 – includes meet & greet with Chris Paul, full buffet (2:30 p.m.), open bar (2-6 p.m.), premium bleacher seat and Chris Paul-signed Bowlero Pin. Premium General Package – $75 – includes full buffet, two non-premium drink tickets and one bleacher seat. General Admission – $50 – Includes one bleacher seat. Standing Room Only – $25. One lucky fan will also have the opportunity to attend, and will win two Celebrity Invitational VIP passes courtesy of the CP3 PBA Celebrity Invitational presented by Go Bowling! Bowlero VIP Sweepstakes. Now through Dec. 16, fans can enter to win by following the @BowleroBowl Instagram, liking the “CP3 PBA Celebrity Invitational Sweepstakes Instagram post, and tagging a friend they’d like to bring in the comments section. One winner will be selected at random and announced on Dec. 21. Sweepstakes rules can be found here. The Celebrity Invitational begins with a red carpet ceremony at 3 p.m. CT (doors open at 2 p.m.) on Jan. 17 at Bowlero The Woodlands (27000 I-45 N, Conroe, TX 77385) with the FOX taping of competition beginning at 4 p.m. In addition to Paul, who won the 2018 doubles title with PBA Hall of Fame partner Norm Duke, the event will feature a number of celebrities and PBA Tour stars. The full lineup of celebrities and PBA players will be announced soon. One of the first celebrities to commit to the event is NASCAR star Aric Almirola, a two-time Monster Energy NASCAR Cup series title winner who was a finalist in the 2018 NASCAR Cup playoffs. Also expected to return to the 2019 tournament are Boston Red Sox All-Star outfielder, 2018 American League MVP and World Series champion Mookie Betts along with 2018 NFL Hall of Fame inductee Terrell Owens. Other celebrity bowlers who have participated in previous events include NBA stars LeBron James, Dwyane Wade, Blake Griffin and Kevin Durant; NFL stars Michael Strahan, Hines Ward, LaMarr Woodley, Reggie Bush, C.J. Anderson; hip-hop stars DJ Khaled, Chris “Ludacris” Bridges, Lil Wayne, French Montana and Nelly; television personality Chris Hardwick; comedian/motion picture star Kevin Hart; television star Jesse Williams, and U.S. Olympians Allyson Felix and Hope Solo, among others.